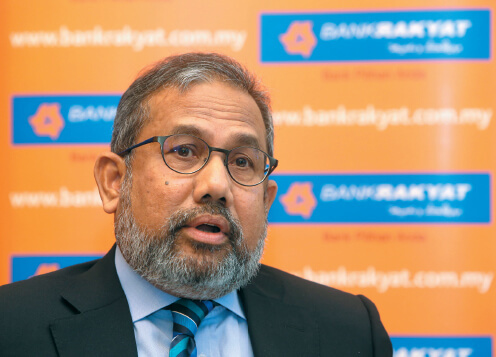 AFTER years of relying on personal financing (PF) to drive its growth, Bank Kerjasama Rakyat Malaysia Bhd (Bank Rakyat) has finally laid out a long-term plan to diversify its financing portfolio in a bid to grow more sustainably over the long run. The country’s largest development financial institution (DFI) — and, by far, the largest PF player — has embarked on a five-year strategic plan (2018-2022) that will see it growing PF at a more controlled pace of under 1% a year, while expanding its focus on home, auto and SME financing. It will also accelerate growth in the Islamic pawnbroking business known as Ar-Rahnu, from which it hopes to derive significantly stronger earnings, managing director and president Datuk Zulkiflee Abbas Abdul Hamid says. “Currently, about 80% of our total financing is from PF and while the bank has done very well in that area, we realise that we need to diversify into other good areas that have not really been tapped, like Ar-Rahnu,” he tells The Edge in an interview after the bank announced its financial results for the year ended Dec 31, 2017 (FY2017). “This is not to say that we want to slow down PF altogether ... what we want is controlled growth, meaning to say growth of maybe under 1% a year, not 5% to 10% like in the last few years,” he adds. Zulkiflee, a veteran banker who came out of retirement to take on the top job at the bank last April, and his team had started developing the bank’s long-term strategy, themed “Stability and Sustainability”, last year. 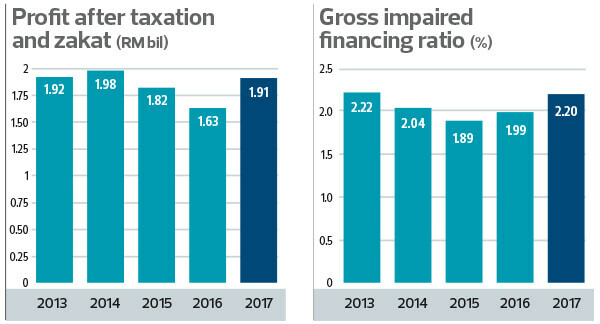 As such, the effort to slow down the PF business is already evident in FY2017 — the PF portfolio grew at just 0.6% compared with 5.1% a year earlier, while overall gross financing grew 2.1% to RM70.6 billion. Bank Rakyat is unlike ordinary commercial banks. Set up under the Co-operative Societies Act Act 1993, it is essentially a cooperative bank that does mainly retail banking — almost 90% of its assets are retail assets — and the bulk of its customers are civil servants. The bank’s business has long been skewed towards PF. Thanks to a system of automatic salary deductions, monthly repayments from civil servants have been good, keeping the bank’s gross impaired financing (GIF) ratio in that space impressively low at 0.7%. However, critics point out that given the fast-changing and much more competitive banking landscape, it can’t move forward on the same business model. “For how much longer can you tap the civil servant PF market? It’s getting to be a saturated market as they are already a highly leveraged lot ... there’s no question that you need to diversify,” a banking analyst observes. Bank Rakyat is by far the biggest PF player in town. To put things in perspective, its RM56 billion PF portfolio as at end-2017 was almost as large as that of the entire banking system’s RM69.36 billion. (The banking system data that Bank Negara Malaysia provides on a monthly basis does not include DFIs or non-bank lenders). Its PF portfolio is also more than double that of the next largest player, non-bank lender Malaysia Building Society Bhd (RM22.51 billion). “We would like to reduce the proportion of PF to our total financing to maybe 70% in the next one or two years, for a start. By the end of five years, I think we’ll be around 65% to 70%. To us, it’s simple — if we are able to accelerate our other businesses, then we can probably slow down further on PF. We also expect to have a better spread of customers in five years, ” Zulkiflee says. After two years of declining profits, Bank Rakyat managed to buck the trend in FY2017, putting it in a good place to drive the five-year plan which involves making what Zulkiflee calls “structural changes”. “It’s about making structural changes. And the buy-in (from staff) is also going to be quite challenging because it involves change management, not just in the mindset but in the business to be done. So, getting the results from the changes that we want to see, it may take at least five years, if not longer. It also takes time because I’ve got to ensure that the systems are alright in the areas we want to grow in,” he says. The bank chalked up solid 17.2% growth from a year ago in net profit, after statutory appropriations, to RM1.36 billion. This was on the back of a 5.7% increase in revenue to RM6.34 billion, which was driven by higher contribution from financing and investment-related activities, as well as better cost management. Provisions fell 1.7% to around RM523 million, while its overall GIF ratio deteriorated slightly to 2.2% from 2% a year earlier. Provisions may go up this year as the bank embraces the new MFRS 9 accounting standard but it is not likely to be big jump, Zulkiflee says. He does not see the GIF ratio going above 2.3% this year. Bank Rakyat declared a 16% dividend amounting to RM480 million for FY2017, compared with 15% (RM443.8 million) in FY2016. It was the highest sum it has paid out since FY2013 (RM495 million). Home and auto financing grew a strong 25.1% to RM7.98 billion last year, from a low base. Home financing is expected to be one of the bank’s main products going forward, even as it looks to build a niche in auto financing. “We want to grow our share of wallet from these customers, so we plan to cross-sell to them our products like takaful, for instance,” he says. Bank Rakyat is involved in takaful only through joint ventures with other players like Takaful Ikhas Bhd. Zulkiflee expects an increasing number of people to shun car ownership as ride-hailing companies like Grab grow, but he believes there will still be a decent market for auto financing over at least the next three, if not five, years. He says the bank is keen on financing SMEs, especially those that are large cooperatives, but will be selective in financing big government-linked companies. Much of its bad debs in the past were from corporate loans, especially in the construction sector. Meanwhile, Bank Rakyat is steadily beefing up its Ar-Rahnu business, where returns are good — said to be around 10% to 12% — and in which it already has a market share of about 60%. Ar-Rahnu accounted for 11.7% (about RM240 million) of the bank’s PBT last year. “This is an area we want to accelerate. All of our 147 branches can do Ar-Rahnu, and at the same time, we’ve got another 43 specific Ar-Rahnu outlets. So, there are are 190 outlets that can do pawnbroking,” he says. Apart from assets, Bank Rakyat will also diversify its liabilities, which are now heavily skewed towards fixed and corporate deposits, in seeking a lower cost of funds. It will make a concerted effort to boost CASA (current accounts and savings accounts) through new products and campaigns. It expects CASA to comprise at least 15% of its total deposits in “the next one or two years” from 6% now. Though it is not a public-listed listed entity, Bank Rakyat is keenly watched because of its size and for potential M&A moves with other Islamic lenders. With total assets of RM105.45 billion, Bank Rakyat is the second largest Islamic lender after Maybank Islamic Bhd. While its asset size is some way off compared with Maybank Islamic’s , it is not too far off in terms of profitability. Its profit before tax and zakat stood at RM2.05 billion in FY2017 compared with Maybank Islamic’s RM2.75 billion. Zulkiflee says it’s five-year plan does not factor in a merger with any bank, pointing out that as a DFI, it is vastly different from a commercial bank. “As a DFI, we’re not subject to the same Basel III capital requirements as the other banks, but we don’t want to be complacent, and that’s why we’re transitioning to Basel II now. “At the end of the five years, I want us to sustain our position as the No 1 cooperative bank with strong savings, and as a strong Islamic bank. But at the same time, I want us to be comparable to the commercial banks, especially the Islamic ones, because that’s what we pit outselves against. We should not be seen as the bank that only provides PF, or as a government officer’s bank,” he remarks.